July 19, 2018 at 12:10a.m. Photo by David Dermer | Members of the Poland-Canfield softball team are, from left, Emma Wolfe, Alaina Francis, Alaina Scavina, Mia Opalick, Layni Bednar, Meredith Trevis, Bridgette Kelly, Emily Denney and Paige Ogden. McKenna Dinard is not pictured. Emily Denney says it was “incredible” when the Poland-Canfield softball team won the Junior League World Series last August in Kirkland, Wash.
“Many of those girls are my friends, I’ve played softball with them,” said Denney, who will be a freshman at Poland High School. “It was just crazy seeing people from our small town out there in Washington on TV [winning] it. This time, it’s Denney’s turn to try and win Poland’s third straight Junior League Regional Tournament. Denney, who plays third base, is one of seven Poland players who have combined with three Canfield players to create this year’s Poland-Canfield Junior League team. On July 9, Poland-Canfield won the state tournament, defeating West Portsmouth 13-0 and 16-0 in the best-of-three series. 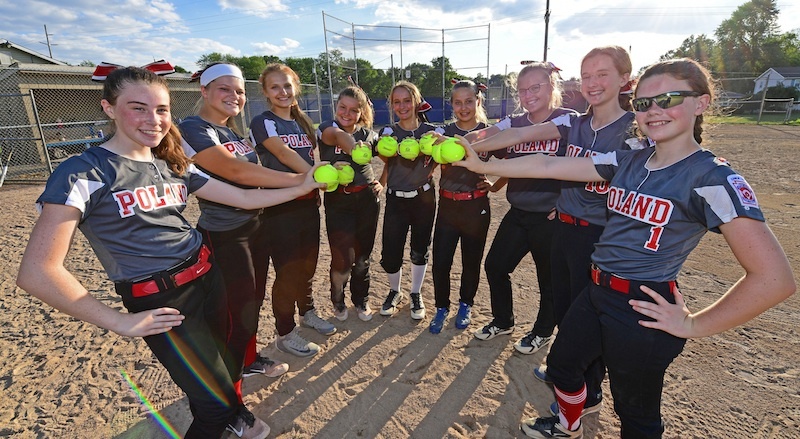 It’s the third straight summer that Poland will be represented at the Junior League Midwest Regional at South Holland, Ill.
“We run-ruled them both games,” Poland-Canfield manager David Wolfe said of the state tournament. Junior League is for players ages 13-14 and this year’s regional format is double-elimination. The other teams competing are from Indiana, Illinois, Michigan, Iowa, Kentucky, Missouri and Wisconsin. Two summers ago, Poland won the Midwest regional to advance to the Junior League World Series in Kirkland, near Seattle. Last summer, Poland combined with Canfield. After repeating at state, Poland-Canfield won the Midwest Regional then won the Junior League World Series. This year’s Poland-Canfield team has no one returning from the championship squad. All of this year’s players are 13 years old. Wolfe’s daughter Rachel played on the 2016 team. But another strong arm was needed. Last summer, Canfield ace KaiLi Gross joined the Poland players. Bobbey and Gross pitched the team to the world title. Wolfe’s team has five pitchers he won’t hesitate to use. “Five good ones, but they are all ,” Wolfe said of facing girls a year older and a little more experienced. Because Junior League has innings restrictions for pitchers, those extra arms could come in handy, especially if the rain in the forecast creates doubleheaders. In addition to Denney, the other Poland players are Paige Ogden (shortstop), Alaina Scavina (outfielder), Alaina Francis (outfielder), Emma Wolfe (second base), Meredith Trevis (outfielder) and McKenna Dinard. The Canfield players are Bridgette Kelly (first base), Layni Bednar (catcher) and Mia Opalick (pitcher). Opalick, who will be the pitcher against Missouri in Saturday’s opener, says she’s been playing against some of her new teammates for eight years. But she’s also played travel ball with Francis. “The first time we [played together], we bonded really well,” said Opalick, who will be an eighth grader at Canfield Village Middle School. Francis, Ogden, Scavina and Wolfe also pitch. Opalick, who plays shortstop when she’s not on the mound, admitted that representing the defending champions makes her “a little bit nervous but [we’ve] got a good team. Denney said she feels pressure, but not because of what happened last summer. “Obviously, I feel pressure because it’s a big tournament, but I don’t feel pressure because of the accomplishments of [last year’s] team because they are not us,” Denney said. “We have different talent. Wolfe has fond memories as a dad watching in South Holland. “It was exciting because it was the first time we had gone beyond state,” Wolfe said. “They do a nice job with the pageantry — opening parade, a dinner where the town dignitaries speak. July 30, 2018 11:32 p.m.
July 30, 2015 12:05 a.m.
August 3, 2018 12:09 a.m.